THIS IS AN INTRODUCTION VIDEO, Visit:- http://www.ishakriya.com – To learn the Simple yet powerful Guided Kriya yoga meditation technique on how to meditate (complete) taught by Sadhguru. There are millions of beginners who have not had an opportunity to learn on how to meditate, how to do yoga meditate, how to do meditation, how to do kriya yoga meditation. I have been very fortunate to taste the ultimate blissfulness, relaxation and come out chronic illness such as insomnia, high blood pressure, anxiety and stress through the kriya yoga techniques, hatha yoga meditation techniques, shoonya meditation techniques, samyama meditation techniques taught by master Sadhguru. Its his wish that the simple yet powerful “Isha kriya” yoga meditation technique video on how to meditate should be shared and taught to the beginners, who have the urge to learn the kriya yoga meditation technique from the comfort at home and to the millions of lifes, who are suffering from chronic diseases such insomnia, anxiety, stress, depression. As this kriya meditation technique, if learnt correctly and properly will give the beginner, benefit of full health, improve / increase concentration, peace of mind, relieve / reduce stress, focus, relieve depression, relieve insomnia, increase memory power, attain to good sleep and ultimately attain to ultimate peace, bliss, relaxation as that is what exactly happened to me! Watch this video to Learn on “how to meditate” and be benefited from guided meditation technique taught by Sadhguru, Pranams! Just say “Om!” Is meditation right for you? As you probably know, the female praying mantis will sometimes bite her mate’s head off. It’s not something that the insects make a habit of, exactly — they probably only do it when a male is particularly aggressive, or when the female really needs a nutrient boost in order to successfully lay her eggs. But when a lady is really hungry, she sometimes throws off fake fertility signals to get a guy into bed. And when that happens, he’s pretty much always on the menu. via When a female mantis is hungry, she fakes fertility to snack on duped mates – The Washington Post. Want to know why? Well, because like BBC, they are not so concerned with me subscribing to their news agency, as they are to providing the news for my knowledge! unlike the LA times, the New York Times, the NBC, ABC, etc, which have taken over the public airwaves and deny access t the news, unless one subscribes (or they allow 5-10 stories /month!) I got an app, weather and newsstand from Google: the shame of any app: it takes for ever to download, but only because of being bloated with commercials, cookies etc.! Same stories, can be accessed and shared directly and very fast, from their news app! KUNJI SAN-Martial Arts Supplies (Access here or visit the widget on the sidebar (way down with 100+ others!) they should open all in anew window, but only WPRESS can secure that! because while you may not agree with all Google is doing, I think many of their initiatives are awesome, and I include Google Translate among those initiatives! Get back to me with how it worked for you here, by a welcome comment! : go do it noow, what you’re waiting for! Excerpts: “…While the fact that 95.5 million Americans said they would shop on Black Friday is good news for retailers, it is a far less positive figure for the environment. Cheap electronics are one of the biggest draws for shoppers on the day (and indeed the rest of the year), but these immediate savings hide the ultimate collective cost – old electronics (e-waste) that are improperly disposed can result in environmental pollution with its attendant health risks, as well as data theft. 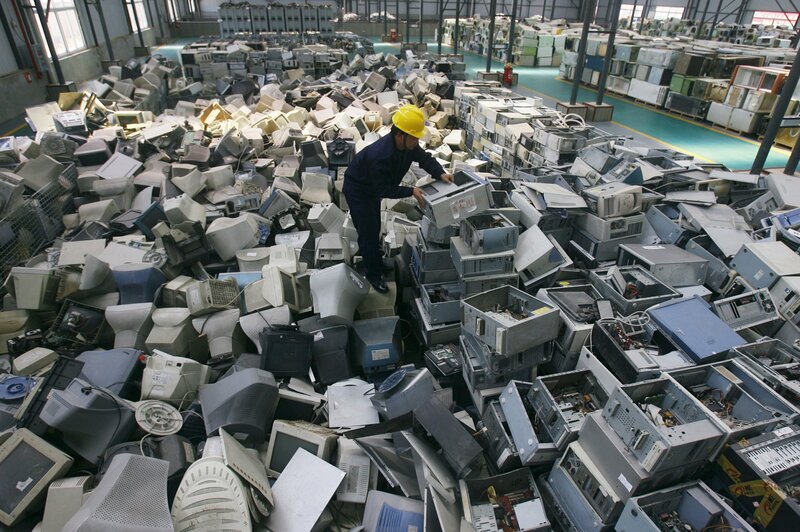 via Mounting Electronic Waste Poses Major Threat to Environment, Health. Is it OK to leave objects on the Moon? In the last year, the most important question for US economists and economic journalists has changed from Where are the jobs? to Where are the wages? It’s a problem best summed up by Matthew O’Brien in the Washington Post. As the labor market approaches full employment, there should be more pressure on wages to rise. In the graph below, that would look like a trend-line pointing up and to the left. Instead, as you can see in a half-a-second glance, the trend-line is a blob and it’s certainly not pointing up. The unemployment rate has fallen below 6 percent, and earnings growth is flat. via The Rise of Invisible Unemployment – The Atlantic. Part 2 of 2: The BBC is allowed to film in Cuba and show life under the absurd US trade embargo. Whilst the US moralises over a tiny Cuba, they do nothing about the likes of Iran, China and North Korea, who all have dubious human rights records. But of course, it’s easy to pick on a little island instead of a big country. Recorded from BBC 1pm News, 26 February 2010.
via Where Do the World’s Wealthiest People Live? – Real Time Economics – WSJ. Would You Like Opium with That? “Sierra Leone’s explosion of Ebola cases in early summer all appears to stem from one traditional healer’s funeral at which 14 women were infected, according to scientists studying the blood of victims. 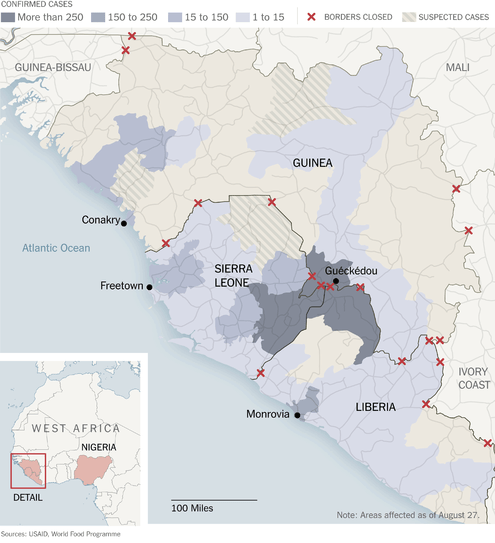 via Ebola Outbreak in Sierra Leone Is Tied to One Funeral – NYTimes.com. To fight the horde, singing and crying: Valhalla, I am coming!On we sweep with threshing oar, Our only goal will be the western shore. In the weeks leading up to June 3, 1989 tens of thousands of students massed in Beijing’s enormous central square, drawn together by the death of liberal Communist Party figure Hu Yaobang and their collective desire for significant and immediate change. They wanted their hard-line leaders to yield and reform. They wanted a free, fairer China. For China’s communist rulers it was a great affront to their authority. A provocation. They answered with soldiers, tanks and wholesale slaughter. “We went to see the two major student leaders and that’s when one told us crying that that night the soldiers would come, that there would be a lot of bloodshed, that a lot of people would die.” PETER EVERETT Defence Attaché, Australian Embassy Beijing, 1989. A lot of people did die. Precisely how many, we’ll never know. And to this day many Chinese themselves don’t even know the massacre took place. Despite the warp-speed advances in China’s economy and — to a limited extent — its openness, Tiananmen is still an officially forbidden subject. Until now the collective perspectives of Australia’s witnesses to Tiananmen have pretty much stayed under wraps as well. But in this extraordinarily revealing Foreign Correspondent key Embassy staffers have assembled for the first time to give their accounts of what happened. Gunpowder tea (珠茶; pinyin: zhū chá) is a form of green Chinese tea produced in Zhejiang Province of China in which each leaf has been rolled into a small round pellet. It is believed to take its English name from the fact that the tea resembles grains of black powder. This rolling method of shaping tea is most often applied either to dried green tea (the most commonly encountered variety outside China) or Oolong tea. 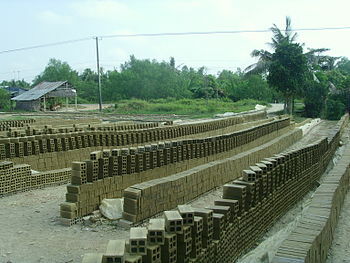 Gunpowder tea production dates back to the Tang Dynasty 618–907. It was first introduced to Taiwan in the 19th century. Gunpowder tea leaves are withered, steamed, rolled, and then dried. Although the individual leaves were formerly rolled by hand, today most gunpowder tea is rolled by machines (though the highest grades are still rolled by hand). Rolling renders the leaves less susceptible to physical damage and breakage and allows them to retain more of their flavor and aroma. In addition, it allows certain types of oolong teas to be aged for decades if they are cared for by being occasionally roasted. When buying gunpowder tea it is important to look for shiny pellets, which indicate that the tea is relatively fresh. Pellet size is also associated with quality, larger pellets being considered a mark of lower quality tea. High quality gunpowder tea will have small, tightly rolled pellets. Pingshui gunpowder (平水珠茶): The original and most common variety of gunpowder tea with larger pearls, better color, and a more aromatic infusion, which is commonly sold as Temple of Heaven Gunpowder or Pinhead Gunpowder, the former, a common brand of this tea variety. Formosa gunpowder: A gunpowder style tea grown in Taiwan near Keelung, it is claimed to have its own characteristic aroma, different from that of Zhejiang Province gunpowder grown in mainland China. Formosa gunpowder teas are typically fresh or roasted oolongs. Ceylon gunpowder: A gunpowder variant grown in Sri Lanka, usually at altitudes exceeding 1,800 metres (6,000 ft), see Green Ceylon teas. Several types of green teas are commonly rolled into “gunpowder” form, including Chunmee, Tieguanyin, Huang Guanyin, and Dong Ding, as well as many other oolong and higher-end jasmine teas. In Chinese, gunpowder tea is called zhū chá (珠茶; literally “pearl tea” or “bead tea”; not to be confused with boba tea). The origin of the English term may come from the tea’s similarity in appearance to actual gunpowder: greyish, dark pellets of irregular shape used as explosive propellant for early guns. The name may also have arisen from the fact that the grey-green leaf is tightly rolled into a tiny pellet and “explodes” into a long leaf upon being steeped in hot water. Another explanation is that the tea can also have a smoky flavor. While brewing methods vary widely by tea and individual preferences, 1 teaspoon of looseleaf tea is recommended for every 150ml (5.07 oz) of water. Ideal water temperature for this type of tea is between 70 °C (158 °F) to 80 °C (176 °F). For the first and second brewing, leaves should be steeped for around one minute. It is also recommended that the tea cup or tea pot used should be rinsed with hot water prior to brewing the tea to warm the vessels. When brewed, gunpowder tea is a yellow color. The flavor of brewed gunpowder tea is often described as thick and strong like a soft honey, but with a smokey flavor and an aftertaste that is slightly coppery. This type of tea is often seen as having a flavor that is somewhat grassy, minty, or peppery. 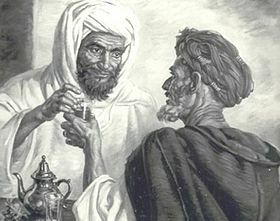 Gunpowder tea is exported to the Maghreb where it is used in the preparation of traditional North African mint tea. The Moroccan tea ritual is at the heart of any social gathering, from an informal visit to a neighbour to lavish soirees with dignitaries. A minimum of two cups need to be drunk so as not to offend the host. Moroccan mint tea is made by adding mint and sugar or honey to gunpowder tea after brewing.